THE LOOP — The latest art installation to take over State Street will be the work of Logan Square artist Nate Otto, who recently quit his day job to pursue art full time after realizing "something was missing from his life." "I've always been an artist, but I didn't know always that it was possible to do it as a career," said the Columbia College Chicago alumnus, who previously worked for seven years teaching art and other subjects to adults with disabilities. "I've always made art on the side, and it wasn't until a couple of years ago that I really doubled down on the art stuff, and just dedicated myself to doing the work." The timing to make the leap was risky. A year ago, Otto married Ballet Chicago dance instructor Megan Wright, and worried whether pursuing his passion full time was sustainable. Now, Otto's staring down a month packed with festival and studio showcases and three contracts for murals featuring his signature cartoonish skyline style. And from Thursday through Nov. 1, banners of his paintings, titled "CityScape," will hang right outside the window of his wife's State Street studio. 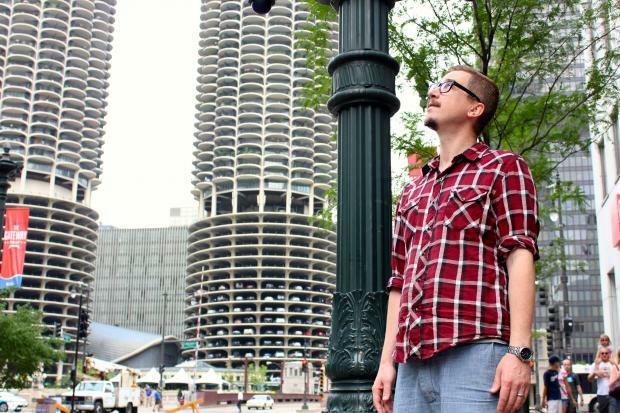 Chicago Loop Alliance curator Tristan Hummel said Otto's work is "both profoundly Chicago, and not some tacky, contrived, Chicago symbol," which is exactly what he was looking to feature on the State Street banners. "Nate Otto is a powerful painter and follows seemingly in the tradition of the Chicago Imagists of the '60s and '70s. ... [He] is the perfect artist to adorn a civic feature like the light pole banners, because he both exemplifies the best qualities of a magnificent contemporary artists and represents a very Chicago style of artwork." Otto says that although viewers may not be able to pick out Marina City or Willis Tower from his semi-abstract, colorful "CityScape," his inspiration draws heavily from the city he's called home for more than 15 years. "When I'm down [in the Loop], I'm always looking up," he said. "In my work, I'm expressing the city and what I see around me in different ways, inspired by maps, cartoons, all sorts of different things." Otto says he thinks it's fitting that his art will be interacting with the setting that inspires it. "I really like the idea of my work being part of the landscape, and reflecting the city back on itself," he said. "CityScape" will be displayed on banners along State Street from Congress Parkway to Wacker Drive through Nov. 1.